There are times, especially on large LifeCasting projects where you just run out of time and the alginate begins to set before you're done. Algi-Bond is our solution to this dilemma. Add 2 teaspoons to a quart of warm water and stir until the powder dissolves. 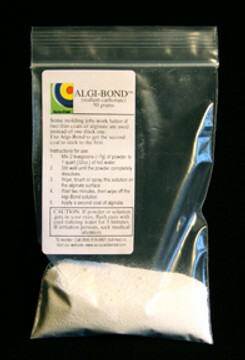 Spray the Algi-Bond solution onto the leading edge of your alginate. Wait 2 minutes and a new batch of alginate will stick to the old one. Special solution softens the alginate on a molecular level so the new alginate can grab hold of the old alginate. This small 50 gram bag of powder makes up to 2 gallons of solution.